Our most popular flight is highly recommended and on sale for a limited time. Book a 30 minute private charter for two passengers and receive $50 off – normally $600. This flight is also available at Sunset! This flight can also be taken as a 30-minute version of our aerial photographic flight. You’ll fly with one of expert photographic and filming pilots as they guide you & your lens to new heights when you fly an aerial photographic sortie with Blue Sky Helicopters! (Includes pre-flight lesson/objectives briefing). 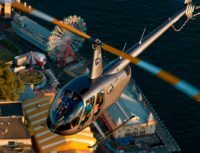 The 30-minute Aerial Photographic Flight takes in the coastal areas & the Harbour as per the City to Surf flight with the option of 1 or more doors off at passenger’s request..
You are purchasing 1,2 or 3 seats on the helicopter and the empty seat or seats will be occupied by other passengers. Pilots Notes: An outstanding flight that you’ll never forget! This flight covers Sydney Harbour & all of Sydney. A great way to see it all in just one hour!